This was such a fun CD for our whole family, but especially my 5 year old. This has been one of his favorite Kids CD's that we have reviewed. Some songs like Swing Low were a fun mix of songs we were familiar with. The use of unique instruments and sounds really make it fun to listen to for young kids! It keeps their interest as the sounds are always changing and catching their attention. The stories interwoven between songs really makes this much more than just a CD of songs. It is a entertaining story and really stopped me from what I was working on, so that I could listen! We love listening to stories on tape and this would fit a similar format. Families should pack a knapsack full of appreciation for the off-the-cuff, improv humor delivered in four "adventure chapters" interwoven among ten musical numbers representing the eclectic taste of this vastly talented ensemble. 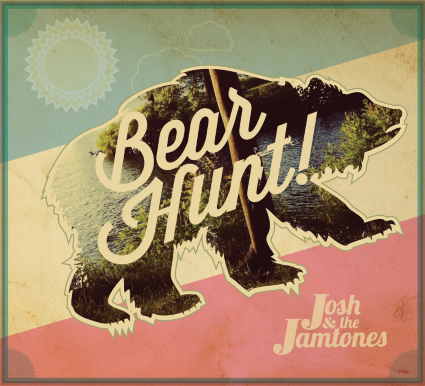 Josh & the Jamtones have created, with Bear Hunt!, a narrative that leaves lots of imagination space and hits just the right note for the 21st century kid brain. Special guest Father Goose (featured on most of the Dan Zanes family albums, including the GRAMMY winning Catch That Train and GRAMMY nominated House Party) brings his authentic, "King of the Dance Party" Caribbean presence to Bear Hunt!, contributing vocals to an up-to-date version of the traditional spiritual "Swing Low" and serving as a modern-sounding "Hype Man" on the Caribbean-influenced "I Love U." Noted for getting families up and dancing, Josh & the Jamtones packed their acclaimed, 2012 debut CD JUMP UP! with massive dance party action. While Bear Hunt! continues to deliver plenty in the get-up-and-dance department, the album expands this energy by the introduction of a cornucopia of musical styles, all delivered with a razor-sharp sense of current musical taste. Josh & the Jamtones slip effortlessly from New Orleans-style street music, roots/reggae, second-wave ska, pure folk, folk-punk, alt-country, and classic country/bluegrass to an epic choral finale of MGM proportions. Josh & the Jamtones came to life when a group of highly trained musicians (all graduates of the famed Berklee College of Music) found themselves teaching kids and families at Josh Shriber's popular Jammin' With You! Program and Performance Center in Wellesley, MA. The six-member Josh & the Jamtones band began performing in 2011 and quickly became so popular that, in record time, they received offers to play such venues as the Life is Good Festival, Fenway Park, Earthfest, The Regent Theatre, Coolidge Corner, Kindiefest, a special Sirius/XM Kids Place Live New Year's Eve broadcast, and even opening for The Wiggles! Check out the Josh & the Jamtones website at http://joshandthejamtones.com. Josh & the Jamtones on Facebook: http://facebook.com/joshandthejamtones.